Located along the scenic West Fork of the Bitterroot River is an historic district containing three 1930s-era historic log buildings. A multi-year effort to restore these historic structures is nearing completion, but has one large effort remaining: the West Fork garage. This log cabin structure located between the Ranger's house and the cookhouse, features craftsman detailing, and is an excellent example of a "standard plan" building constructed during the Civilian Conservation Corps (CCC)-era of the Forest Service. 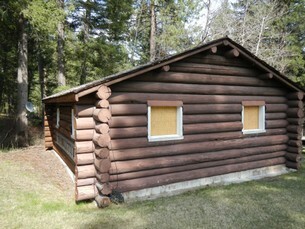 The building requires replacement of approximately 80% of its logs, and volunteers will have the opportunity to learn historic log cabin construction techniques. Please note, familiarity with hand tools, including power tools, and woodworking or carpentry experience is required, and there will be some hard work involved. However, there is also much to see and do here during your hours "off the clock," so we hope to see you this summer!